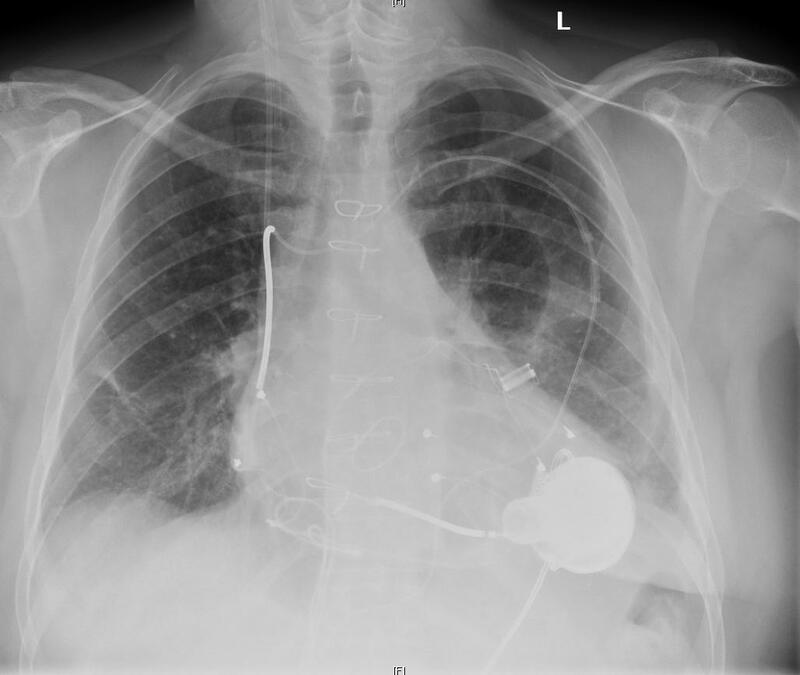 A 58-year old man receives a left ventricular assist device (LVAD) for chronic end-stage heart failure in 2010. His LVAD is initially placed as a bridge to transplant. However his post-operative course is complicated by persistent chronic infection, multiple embolic strokes and prolonged hospitalization. He is taken off the transplant list. In 2012 he is readmitted to the hospital from a long-term acute care facility for aortic valvuloplasty and LVAD weaning studies. This hospitalization is complicated by a hematoma causing nerve compression in his right leg and he is no longer able to walk. He tells the cardiothoracic surgery team that he wants his LVAD to be turned off and the team calls a palliative care consult. Most commonly, palliative care clinicians are called to assist with the decision about whether to discontinue a LVAD, as occurred in this case of the month. At this advanced disease stage, not all patients will be able to communicate or have capacity to make decisions. However, conversations should include patients if they are able to participate and want to be involved. A first step is to assess what the patient and/or family understand about heart failure and the LVAD. Opening with a simple question such as “tell me what you understand about your disease” or “tell me what the doctors have talked with you about so far” can offer significant insights. Clinicians should follow up by asking what the patient and/or family want to know before offering additional information or clarifying misperceptions. The next step is to talk about overall goals of care. “Help me to understand what is important to you” is a good question to initiate this discussion. In this case, the patient described an acceptable quality of life as being able to walk and live independently. Once the patient’s goals have been articulated, the physician can help to develop a treatment plan that matches the patient’s values. (3) In this case, after multiple discussions, the patient made it clear that the burdens of the LVAD now outweighed its benefits for this patient. Ethical guidelines and legal precedents support a patient’s right to request the withdrawal of any medical intervention, regardless of whether the patient is terminally ill and regardless of whether the intervention prolongs life. (4) If a patient lacks capacity, these rights extend to the appropriate surrogate decision maker. No ethical or legal distinction is made between different types of life-prolonging interventions (i.e., LVADs vs. feeding tubes vs. hemodialysis). Some clinicians have moral objections to turning off an LVAD. In such cases, the clinician should inform the patient of these objections without imposing his or her personal beliefs and help to find a colleague who can fulfill this role. Turning off an LVAD requires a coordinated effort between physicians and nurses. The palliative care team can be helpful in answering questions and providing support for clinical staff as well as the patient and family. Most often when a LVAD is turned off the patient dies within minutes. However, if there is intrinsic heart function the patient may live for several days. Patients and families should be prepared for these outcomes. Medications such as opioids and benzodiazepines are used to ensure that the patient is comfortable. Premedication is important because most patients will have a significant decrease in cardiac output after the device is turned off. The LVAD was turned off at the patient’s bedside. Morphine was given by both bolus and infusion to help control symptoms of dyspnea after the LVAD was turned off. He died comfortably approximately 48 hours later. 4. Lampert R, Hayes DL, Annas GJ, Farley MA, Goldstein NE, Hamilton RM, et al. HRS ExpertConsensus Statement on the Management ofCardiovascular Implantable Electronic Devices(CIEDs) in patients nearing end of life orrequesting withdrawal of therapy. Heart Rhythm. 2010;7(7):1008-26. Pallimed Case Conference Disclaimer: This post is not intended to substitute good individualized clinical judgement or replace a physician-patient relationship. It is published as a means to illustrate important teaching points in healthcare. Patient details may have been changed by Pallimed editors to help with anonymity. Links and minor edits are made for clarity and Pallimed editorial standards.